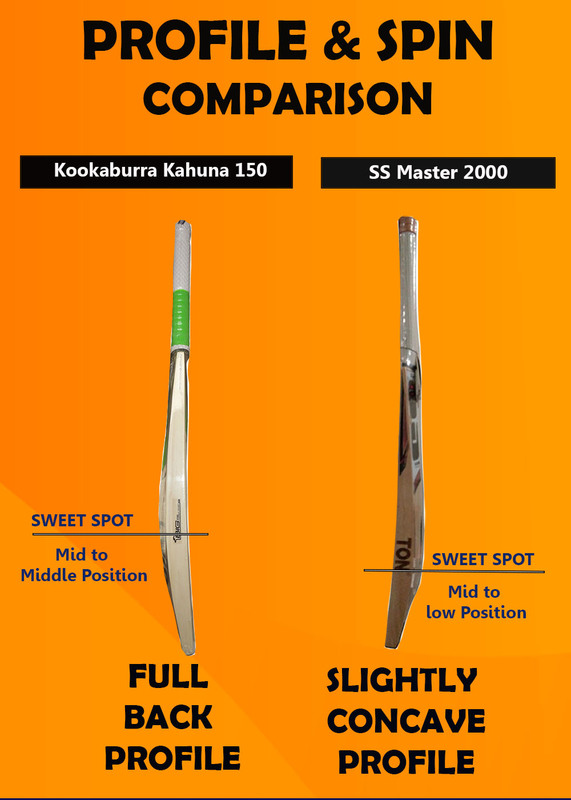 Comparison of Kookaburra Kahuna 150 Vs SS Master 2000 Cricket Bat | Khelmart.org | It's all about Sports. Kookaburra and SS , both the companies manufactured cricket bats for professional players. Players Like ab de villiers, ricky ponting used the Kookaburra Bats while indian players Like sachin tendulkar ,Ravindra jadeja ,Rohit sharma are using the bats from SS Brand. 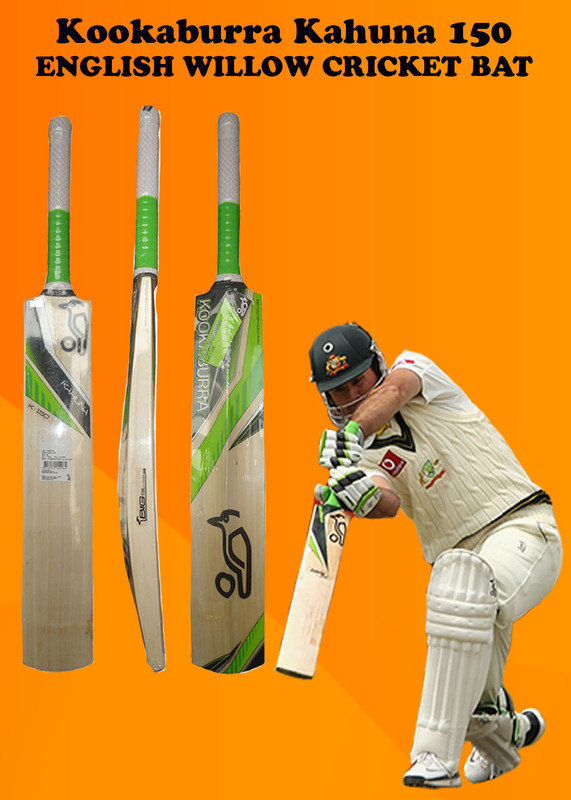 SS Master Series and Kahuna series from Kookaburra are very popular in cricket community. Kookaburra Kahuna 150 and SS master 2000 are best selling bats from these brands and offers best performance. Both the cricket bats are made from Grade 2 English Willow. Weight of both the bats is available in 1160 to 1220 gms based on player’s requirement. Kahuna 150 is manufactured with full back profile which offer enlarges sweet spot position. Kahuna 150 is suitable for attacking game type. SS master 2000 Bat is manufactured with slightly concave profile. 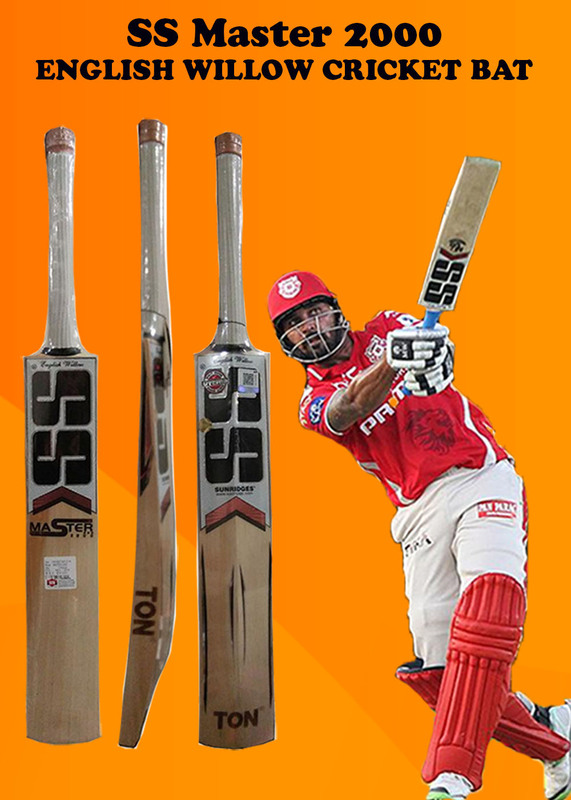 SS master 2000 Bat is suitable for all round type of cricket players. Master 2000 is next version or upgradation of 1000 bat. Players who already tried 1000 bat and want to upgrade can see this bat. Made from selected grade 2 English willow and with state of art SS manufacturing technique, Master 2000 is good option for intermediate cricket players. With low to mid sweet spot position, traditional spine curve and big edges, this bat will give you bland of power and directional control. Player will get weight range starting from 1130 to 1290 gms. This cricket bat gives best possible combination of Power and bat stability. With the help of better bat balance, player gets maximum punch on shots. Master 2000 is new generation bat which is developed for advance cricket player with all new bat features.Checkout Details here. This bat is developed for intermediate Cricket players. Kahuna Series is endorsed by Brad Haddin (Professional player) ,Martin Guptill and AB De Villiers. This bat is developed with grade 2 English Willow with naturally dried technique. Kookaburra used flat face in this bat which generates maximum power on shots. Its mid sweet spot position cricket bat which gives light weight bat feel. Spine profile is 64 mm from base line while edge thickness is around 36 to 40 mm. Kahuna 150 cricket bat top selling bats in its category. It is most popular because of its profile, willow quality and unique bat shape. Bat is equipped with kookaburra big edge concept which enables maximum edge profile near to sweet spot area to improve the overall performance of the cricket bat. Kahuna 150 is developed with 12 piece cane handle with rubber laminated technique which gives best in class bat performance. Checkout the Price of SS and Kookaburra Cricket Bat. 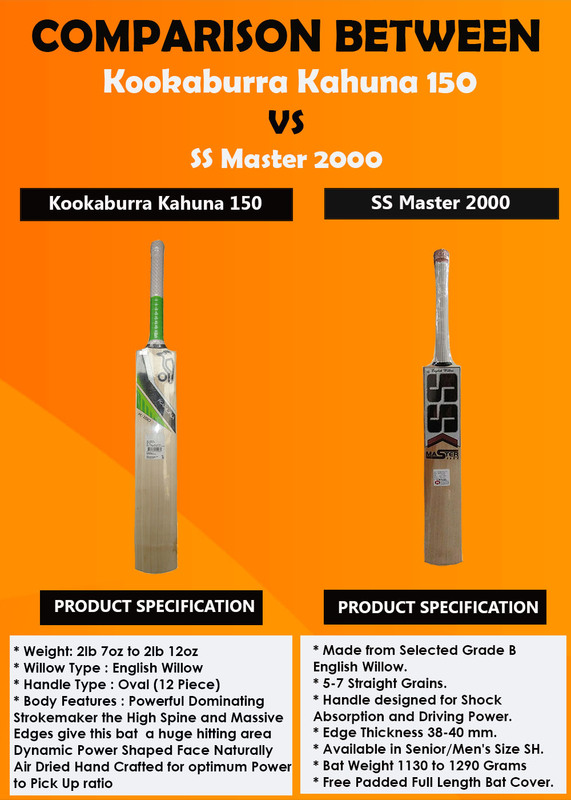 This entry was posted in Cricket and tagged Comparison of Kookaburra Kahuna 150 Vs SS Master 2000 Cricket Bat, Details of Comparison of Kookaburra Kahuna 150 Vs SS Master 2000 Cricket Bat, Images of Comparison of Kookaburra Kahuna 150 Vs SS Master 2000 Cricket Bat, Specification of Comparison of Kookaburra Kahuna 150 Vs SS Master 2000 Cricket Bat. Bookmark the permalink.